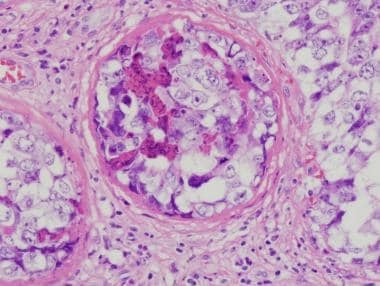 Embryonal carcinoma is a germ cell tumor characterized by primitive epithelial cells with marked pleomorphism and various histologic patterns. It may present in pure form but often is part of a mixed germ cell tumor. Genetic and environmental factors play a role in the development of germ cell tumors, [3, 4] but the importance of specific factors is unclear. 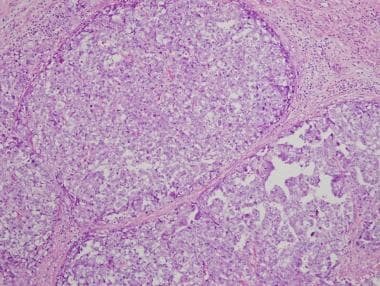 The most accepted theory on the development of germ cell tumors involves an initiating event that causes fetal gonocytes to undergo abnormal cell division. Embryonal carcinomas are located in the testicular parenchyma. These tumors are usually smaller than seminomas. They do not replace the entire testis but have a propensity to invade paratesticular tissue (through the tunica albuginea), rete testis, and epididymis. Vascular invasion is common. Although serum alpha fetoprotein (AFP) has been reported in association with embryonal carcinomas, most of those cases were probably misclassified as such and in truth represented mixed cases of embryonal carcinomas and yolk sac tumors. Association of embryonal carcinomas with syncytiotrophoblastic giant cells may cause increases in serum human chorionic gonadotropin (hCG) levels. A search for those elements may be clinically important in any given case. Levels of other serum markers, such as placental alkaline phosphatase (PLAP) and lactic acid dehydrogenase (LDH), may be elevated. Embryonal carcinomas usually present as ill-defined masses. The cut surface may be smooth or lobulated. Foci of hemorrhage and necrosis are common. The average size is about 3-4cm in most series. Invasion into paratesticular tissue may be detected grossly in about 20% of the patients. It is difficult, if not impossible, to distinguish pure embryonal carcinomas from mixed germ cell tumors grossly; however, teratomatous elements or cystic changes are present in mixed tumors. There are 3 main histologic patterns of embryonal carcinomas—solid (see the first image below); tubular, or glandlike (see the second image below); and papillary (see the third and fourth images below). Any given tumor may show a combination of these patterns. These different patterns, as well as cytologic features, help in distinguishing embryonal carcinomas from seminomas (see the fifth image below). Low-magnification view of embryonal carcinoma showing diffuse sheets of pleomorphic cells with tumor necrosis. 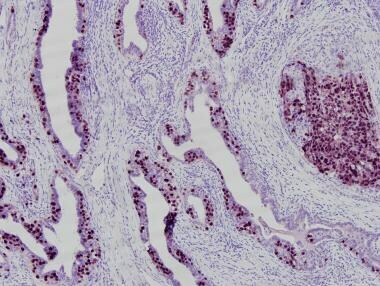 Tubular (glandlike) pattern of embryonal carcinoma. Note the long tubules and glandlike lumina surrounded by pleomorphic cells. The latter are either cuboidal, seen lining the lumina, or round to ovoid, seen in the solid areas. Embryonal carcinoma showing solid (upper left) and papillary (lower right) patterns. High-magnification view of embryonal carcinoma with papillary pattern. Mixed germ cell tumor. 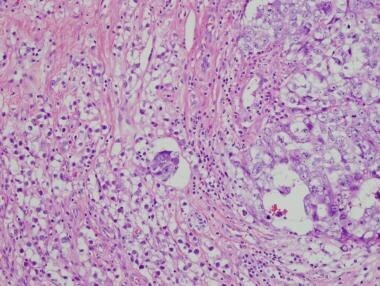 Visible on the right side of the image is embryonal carcinoma, characterized by pleomorphic cells with glassy nuclei and prominent nuclei. Cellular borders are indistinct. 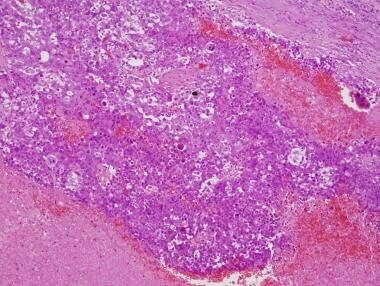 By comparison, seminoma is visible on the left side of the image. 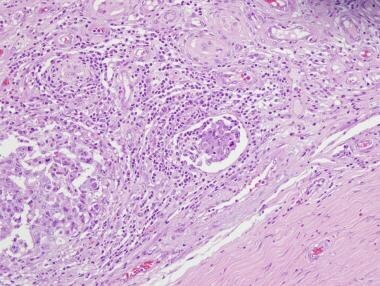 In seminoma, the cells are less pleomorphic and have conspicuous membranes. Diffuse sheets of anaplastic cells characterize the solid pattern, and one may commonly find punctuate foci of necrosis. The tubular pattern may be prominent and cause confusion with yolk sac tumors, but cytologic features readily distinguish these neoplasms. The cells of embryonal carcinoma in the tubular pattern may have a columnar appearance, lining the glandlike lumina. There are no prognostic differences associated with the histologic patterns; the type of pattern should not be included in the surgical pathology report unless as a comment regarding the differential diagnoses. The necrosis seen in embryonal carcinomas is usually of the coagulative type, with dense eosinophilic debris and cellular debris. Mitoses are frequent. In some cases, there is a distinct spindle cell stroma around tumor nests. The recognition of this feature is important in distinguishing embryonal carcinoma from the stroma of teratoma, especially in cases of pure forms of embryonal carcinoma. 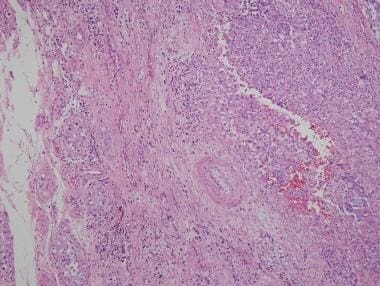 Intratubular embryonal carcinoma is commonly associated with embryonal carcinoma (see the image below). 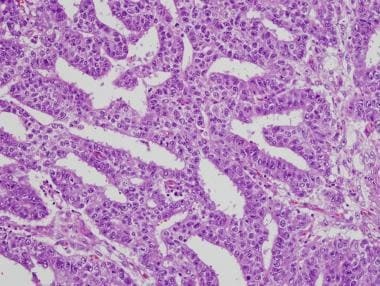 Intratubular embryonal carcinoma has a unique histologic appearance of densely eosinophilic necrotic debris involving native seminiferous tubules; it is surrounded by typical embryonal carcinoma cells. Intratubular embryonal carcinoma. Dense, eosinophilic, necrotic debris in association with embryonal carcinoma cells is filling the seminiferous tubule. 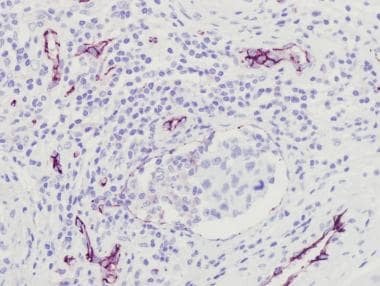 Low-magnification image of embryonal carcinoma showing a cluster of cells (center of the field) with retraction and empty space, which suggests invasion of the vascular space. 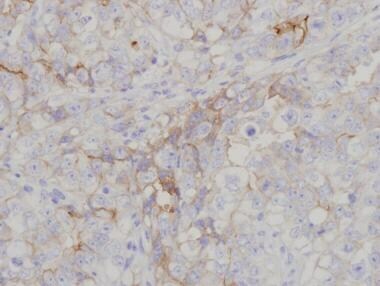 Same area seen in the image above after immunohistochemistry staining with CD31. Endothelial lining is apparent around tumor cells, confirming small-vessel invasion. High-magnification view showing clusters of embryonal carcinoma cells in lymphovascular spaces. Extension into paratesticular tissue should be documented if present; it represents a change in pathologic stage (see the first image below). In difficult cases in which the differential diagnosis includes metastatic carcinomas, association with intratubular germ cell neoplasia supports a diagnosis of germ cell tumor (see the second image below). Embryonal carcinoma extending into paratesticular adipose tissue. 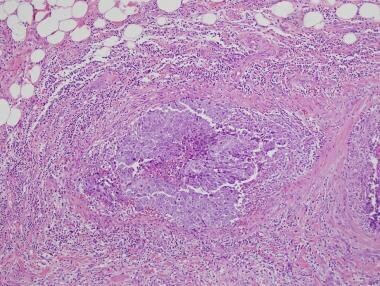 Embryonal carcinoma (right) in association with intratubular germ cell neoplasia on surrounding testis (left). The histology of embryonal carcinomas is easily recognizable and is distinct from those of other common germ cell neoplasms, such as seminoma, yolk sac tumor, and choriocarcinoma. As stated above, immunohistochemistry may aid in the differentiation in difficult cases. Pleomorphic seminomas (so-called “anaplastic” seminomas or seminomas with high mitotic rate) may be confused with embryonal carcinoma. In older patients, large cell lymphoma and metastatic disease should be included in the differential diagnosis. OCT3/4 immunohistochemistry marking embryonal carcinoma (solid area on right) and involvement of rete testis by embryonal carcinoma cells (left). Embryonal carcinoma showing membranous positivity to immunohistochemistry staining with CAM5.2. Individual tumor cells positive for CD30. The gene on i(12p) that may be involved in the carcinogenesis of germ cell tumors has not been identified. The i(12p) abnormality may be detected using commercially available probes and has great potential in clinicopathologic research. Currently, however, it does not have important applications in the clinical setting. In addition to classification in accordance with the TNM stage, the classification of testicular tumors incorporates serum marker levels—specifically, lactase dehydrogenase (LDH), human chorionic gonadotropin (hCG), and AFP levels. Relapse occurs in about 20% of patients for whom embryonal carcinoma is identified in the orchiectomy specimen. Ipsilateral retroperitoneal lymph node dissection may be warranted in patients with a higher percentage of embryonal carcinoma (in some centers, a 40% cutoff is advocated). Because retroperitoneal lymph node dissection is capable of eradicating resectable disease in the majority of patients with stage N1-N2 tumors, determination of the amount of embryonal carcinoma in a given tumor may influence the clinical decision to explore the retroperitoneal space. The role of the pathologist is to adequately quantify the percentages of each tumor in the specimen. Krag Jacobsen G, Barlebo H, Olsen J, et al. Testicular germ cell tumours in Denmark 1976-1980. Pathology of 1058 consecutive cases. Acta Radiol Oncol. 1984. 23(4):239-47. [Medline]. Mostofi FK, Sesterhenn IA, Davis CJ Jr. Developments in histopathology of testicular germ cell tumors. Semin Urol. 1988 Aug. 6(3):171-88. [Medline]. Hardell L, Nasman A, Ohlson CG, Fredrikson M. Case-control study on risk factors for testicular cancer. Int J Oncol. 1998 Dec. 13(6):1299-303. [Medline]. Oosterhuis JW, Looijenga LH. Current views on the pathogenesis of testicular germ cell tumours and perspectives for future research: highlights of the 5th Copenhagen Workshop on Carcinoma in situ and Cancer of the Testis. APMIS. 2003 Jan. 111(1):280-9. [Medline]. De Jong J, Weeda S, Gillis AJ, Oosterhuis JW, Looijenga LH. Differential methylation of the OCT3/4 upstream region in primary human testicular germ cell tumors. Oncol Rep. 2007 Jul. 18(1):127-32. [Medline]. Hatada I, Morita S, Kimura M, Horii T, Yamashita R, Nakai K. Genome-wide demethylation during neural differentiation of P19 embryonal carcinoma cells. J Hum Genet. 2008. 53(2):185-91. [Medline]. Ushida H, Kawakami T, Minami K, et al. Methylation profile of DNA repetitive elements in human testicular germ cell tumor. Mol Carcinog. 2012 Sep. 51(9):711-22. [Medline]. Van Der Zwan YG, Stoop H, Rossello F, White SJ, Looijenga LH. Role of epigenetics in the etiology of germ cell cancer. Int J Dev Biol. 2013. 57(2-4):299-308. [Medline]. Jacobsen GK, Henriksen OB, von der Maase H. Carcinoma in situ of testicular tissue adjacent to malignant germ-cell tumors: a study of 105 cases. Cancer. 1981 Jun 1. 47(11):2660-2. [Medline]. Skakkebaek NE. Carcinoma in situ of the testis: frequency and relationship to invasive germ cell tumours in infertile men. Histopathology. 2002 Sep. 41(3A):5-18. [Medline]. Burke AP, Mostofi FK. 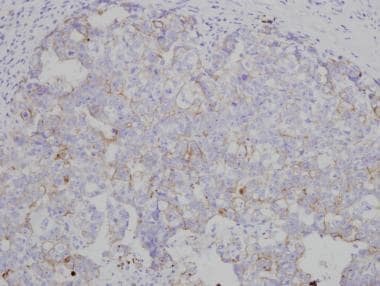 Placental alkaline phosphatase immunohistochemistry of intratubular malignant germ cells and associated testicular germ cell tumors. Hum Pathol. 1988 Jun. 19(6):663-70. [Medline]. Halme A, Kellokumpu-Lehtinen P, Lehtonen T, Teppo L. Morphology of testicular germ cell tumours in treated and untreated cryptorchidism. Br J Urol. 1989 Jul. 64(1):78-83. [Medline]. Pike MC, Chilvers C, Peckham MJ. Effect of age at orchidopexy on risk of testicular cancer. Lancet. 1986 May 31. 1(8492):1246-8. [Medline]. Sharpe RM, Mitchell RT. The downside of 'inappropriate messaging': new insight into the development of testicular germ cell tumours in young men?. J Pathol. 2013 Mar. 229(4):497-501. [Medline]. Ishida M, Hasegawa M, Kanao K, Oyama M, Nakajima Y. Non-palpable testicular embryonal carcinoma diagnosed by ultrasound: a case report. Jpn J Clin Oncol. 2009 Feb. 39(2):124-6. [Medline]. Lau SK, Weiss LM, Chu PG. Association of intratubular seminoma and intratubular embryonal carcinoma with invasive testicular germ cell tumors. Am J Surg Pathol. 2007 Jul. 31(7):1045-9. [Medline]. Gilbert DC, Al-Saadi R, Thway K, Chandler I, Berney D, Gabe R, et al. Defining a New Prognostic Index for Stage I Nonseminomatous Germ Cell Tumors Using CXCL12 Expression and Proportion of Embryonal Carcinoma. Clin Cancer Res. 2016 Mar 1. 22(5):1265-73. [Medline]. Cheng L, Sung MT, Cossu-Rocca P, Jones TD, MacLennan GT, De Jong J. OCT4: biological functions and clinical applications as a marker of germ cell neoplasia. J Pathol. 2007 Jan. 211(1):1-9. [Medline]. Sung MT, Jones TD, Beck SD, Foster RS, Cheng L. OCT4 is superior to CD30 in the diagnosis of metastatic embryonal carcinomas after chemotherapy. Hum Pathol. 2006 Jun. 37(6):662-7. [Medline]. Rijlaarsdam MA, van Herk HA, Gillis AJ, et al. Specific detection of OCT3/4 isoform A/B/B1 expression in solid (germ cell) tumours and cell lines: confirmation of OCT3/4 specificity for germ cell tumours. Br J Cancer. 2011 Sep 6. 105(6):854-63. [Medline]. Stoop H, Kirkels W, Dohle GR, et al. 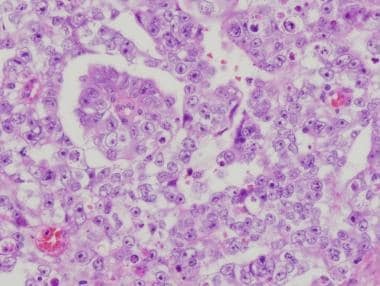 Diagnosis of testicular carcinoma in situ '(intratubular and microinvasive)' seminoma and embryonal carcinoma using direct enzymatic alkaline phosphatase reactivity on frozen histological sections. Histopathology. 2011 Feb. 58(3):440-6. [Medline]. Gilbert DC, McIntyre A, Summersgill B, et al. Minimum regions of genomic imbalance in stage I testicular embryonal carcinoma and association of 22q loss with relapse. Genes Chromosomes Cancer. 2011 Mar. 50(3):186-95. [Medline]. Beeker A, Boven E, Lefesvre P, Golding R, van Groeningen CJ. Retroperitoneal mature teratoma after orchidectomy for a stage IB pure embryonal testicular carcinoma. Int J Clin Oncol. 2008 Feb. 13(1):71-3. [Medline]. Kato M, Ikeda Y, Namiki S, Saito S, Ito A, Arai Y. Spontaneous regression of pulmonary metastases from testicular embryonal carcinoma. Int J Urol. 2008 Mar. 15(3):265-6. [Medline]. Rodriguez PN, Hafez GR, Messing EM. Nonseminomatous germ cell tumor of the testicle: does extensive staging of the primary tumor predict the likelihood of metastatic disease?. J Urol. 1986 Sep. 136(3):604-8. [Medline]. Bosl GJ, Lange PH, Nochomovitz LE, et al. Tumor markers in advanced nonseminomatous testicular cancer. Cancer. 1981 Feb 1. 47(3):572-6. [Medline]. Moul JW, McCarthy WF, Fernandez EB, Sesterhenn IA. Percentage of embryonal carcinoma and of vascular invasion predicts pathological stage in clinical stage I nonseminomatous testicular cancer. Cancer Res. 1994 Jan 15. 54(2):362-4. [Medline]. Mostofi FK, Sesterhenn IA. Pathology of germ cell tumors of testes. Prog Clin Biol Res. 1985. 203:1-34. [Medline].